Duncan graduated from the University of Aberdeen in 2012 with a BA (Hons) in Finance and started his career in Financial Services in the same year. In December 2017 Duncan achieved the status of Chartered Financial Planner which is widely recognised as the gold standard qualification available for professional financial planners/ financial advisers in the United Kingdom. He also holds the Certificate in Discretionary Investment Management, Certificate in Long Term Care and is a Later Life Specialist. 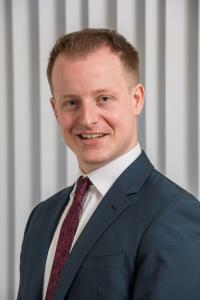 Duncan joined Blackadders Wealth Management in July 2017 and is responsible for providing our clients with holistic financial advice which is centred on client’s objectives and circumstances. Duncan takes a particular interest in pensions, retirement planning and cash flow modelling. He is also a strong advocate of the importance of cash flow modelling being central to creating a client’s financial plan. Away from work, Duncan and his wife enjoy spending time walking their dogs. Duncan also enjoys playing golf and is an avid supporter of Scottish Rugby.